caused by leaks from rads or valves. For more information on how to remove dark stains on hardwood floors go to the Floors/Walls/Stairs section or click here. Cast iron radiators. Convectors. Stain removal on hardwood floors. 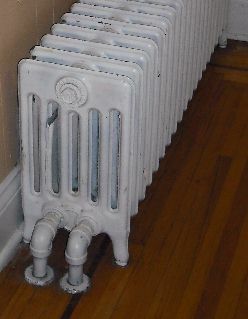 Radiators are usually made of cast iron, are very heavy and give off heat by radiation. A large amount of heat will be lost inside the wall cavity behind each unit. To prevent this heat loss into the wall, place a foil covered sheet behind the radiator so that more heat will be reflected back into the room. Control valve. This valve is located near the floor. It controls the amount of water flowing through the radiator which makes it possible to balance the heat distribution to different parts of the house. Air bleed valve. This small valve is located near the top of the radiator. Trapped air prevents hot water from entering the radiator. The air can be released by opening the air bleed valve until there is a stream of water (have a pail handy!). Radiators and convectors should be bled annually at the start of the heating season. Length can be adjusted. The old cast iron radiator is made up of several individual sections to form one unit. If the unit has to be relocated during renovation it can be made as long or as short as required. Leaking. Occasionally a radiator will leak, but most problems are associated with sticky or leaking valves. Repairs should be made at once to prevent more serious damage and/or discoloured hardwood flooring. Convectors. In newer systems radiators have been replaced by convectors. They come in all kinds of shapes but the most common one is the baseboard heater. The heating is more cyclical compared to the cast iron radiators. Convectors do not retain much heat when the boiler is off.